Equipment hire booking terms and conditions? There are lots to think about when organising and ultimately undertaking a canoe or kayak expedition, but there a few things you should try your best to remember that will not only benefit you, but other users of the inland or coastal waters that you are exploring. – On rivers, obstacles in your way can damage the boats and potentially you. Think carefully before you decide to attempt rapids or go round fallen trees. If you’re not 100% sure, get out and carry the boat or line it down river. – Be careful when using paddles to push off or away from land or obstacles. They might break. – When landing for a break or to camp, look for somewhere that isn’t too rocky that might damage the boat as you land or capsize the boat. – Make sure you pull the boat right out of the water in case water levels rise and it is washed away. Tie it up for extra security. This also prevents potential damage to the hull of the boat caused by movement of the water rubbing the boat against stones/ rocks underneath – remember you may be liable to damage done to our equipment. 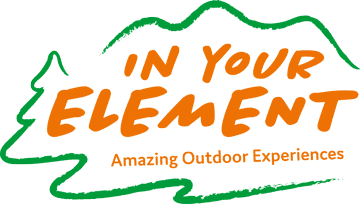 Everyone has a responsibility to try and minimise their impact on the environment when out enjoying themselves on canoe or kayak expeditions. Keep in mind a few key things and it can make a huge difference. – Prepare for extreme weather, hazards, and emergencies. – Schedule your trip to avoid times of high use (busiest months are May and June). – Visit in small groups when possible. Consider splitting larger groups into smaller groups. – Repackage food to minimize waste. – Durable surfaces include established trails and campsites, rock, gravel, dry grasses. – Protect the areas of land near to water by camping at least 50 metres from lochs and streams. – Good campsites are found, not made. Altering a site is not necessary. - In popular areas concentrate use on existing trails and campsites. - Keep campsites small. Focus activity in areas where vegetation is absent. - In pristine areas: Disperse use to prevent the creation of campsites and trails and avoid places where impacts are just beginning. – Pack it in, pack it out. Inspect your campsite and rest areas for rubbish or spilled foods. Pack out all rubbish, leftover food and litter. – Deposit solid human waste in cat-holes dug 15-20cm deep, at least 50 metres from water, camp and trails. Cover and disguise the cat-hole when finished. – Pack out toilet paper and hygiene products. – To wash yourself or your dishes, carry water 50 metres away from streams or lochs and use small amounts of biodegradable soap. Scatter strained dishwater. – Preserve the past: examine, but do not touch cultural or historic structures and artefacts. – Leave rocks, plants and other natural objects as you find them. – Avoid introducing or transporting non-native species. – Do not build structures, furniture, or dig trenches. – Campfires can cause lasting impacts to the backcountry. Use a lightweight stove for cooking and enjoy a candle lantern for light. – Where fires are permitted, use established fire rings, fire pans, or mound fires. – Keep fires small. Only use sticks from the ground that can be broken by hand. – Burn all wood and coals to ash, put out campfires completely, then scatter cool ashes. – Observe wildlife from a distance. Do not follow or approach them. – Never feed animals. Feeding wildlife damages their health, alters natural behaviours, and exposes them to predators and other dangers. – Protect wildlife and your food by storing rations and rubbish securely. – Control pets at all times, or leave them at home. – Avoid wildlife during sensitive times: mating, nesting, raising young, or winter. – Respect other visitors and protect the quality of their experience. – Be courteous. Yield to other users on the trail. – Take breaks and camp away from trails and other visitors. – Let nature’s sounds prevail. Avoid loud voices and noises. These are not meant to be seen as a list of rules, simply some guidelines that can help make a positive difference without spoiling your enjoyment. When you are out and about having fun in the outdoors, there is a risk that you may pick up a tick (little insect), depending on where you are. You need to be aware about ticks, because some of them carry Lymes Disease, which is a debilitating illness. You can find out more about ticks and what to do if you come across one in the following NHS leaflet. Taking a bit of time to plan what you need to take on an expedition can make a huge difference. You don’t want to be left without something important but equally, you don’t want to be carrying too much. Here are some suggestions that might help you get organised. Trainers or other footwear you don’t mind getting wet. Watertight barrels, dry bags or dry pouches to keep your ‘must keep dry’ kit dry – IMPORTANT. Tip: Take an extra pair of waterproof trousers to canoe in, they will get wet but an old pair or cheap ones are great for keeping wind off legs. Tips: Avoid denim or cotton clothing because it doesn’t dry quickly and has no thermal properties when wet. * If you own a Thermarest or similar brand (inflatable sleeping mat) bring it; they give great comfort and warmth and pack small and light. Tips: *If you can find some small hotel style bottles they are great for decanting soap and taking on expedition. It can get cold at night at any time of the year in Scotland so bring enough to stay warm! Remember: keep things to a minimum, small & light. Your favourite feather pillow & the complete works of Shakespeare in hardback may be a bit excessive, and besides you will have to paddle it along with you! The items listed are in addition to the basic equipment you will require before you can do anything, such as buoyancy aid, spare paddles and emergency equipment. Don’t forget the boat! Important: this is not a definitive list of the equipment that you must take with you, it’s simply a guideline designed to help you organise your trip. If you have any questions about what to take with you or the suitability of any particular pieces of kit then please feel free to call us for advice. 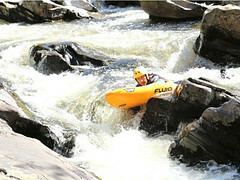 If you go paddling on a river you will, at some point, come across some whitewater. If you’re note sure the difference between a Grade 1 rapid and a Grade 5, then follow this link to the Canoe Scotland website for more information. The differences are really important to understand if you plan to undertake a river trip and don’t have much experience paddling on rivers. Always err on the side of caution and keep safe! Where do I get tides information? Whether you’re in the sea, on the sea or near the sea, Admiralty EasyTide will quickly provide you with valuable tidal information to help you make the most of your time. Where do I get river levels information? Where can I go paddling? Scotland has some of the best paddling environments in the world and we have a right of responsible access to them. With our rights come responsibilities. The following link will take you to the part of the Scottish Canoe Association website, dedicated to providing you with the information needed to enjoy this sport in Scotland responsibly and with sensitivity to our environment. We recommend that you take out travel and personal accident insurance to cover you should anything happen while hiring our equipment. Our insurance would cover you should anything happen as a result of our equipment failing but we do not cover you for anything that happens as a result of your own actions. Travel insurance may also cover you against cancellation fees, e.g. missed flights, last-minute illness. You should also consider joining the Scottish Canoe Association. Membership benefits include Civil Liability Insurance and discount from a range of great suppliers. Alcohol should not be consumed immediately prior to your trip. Anyone found under the influence of alcohol or any other substances may not be permitted to hire or participate (for the safety of themselves and others). We discourage large amounts of alcohol being taken on the water and reserve the right to refuse to hire equipment if we believe this to be the case. We do not object to groups taking alcohol with them as long as it is taken responsibly and litter/ rubbish is not left behind at campsites, for example. Yes you can as long as it is done responsibly. Set your fire somewhere that will prevent it spreading, in an existing fire pit, on a shingle beach or stony foreshore. You should not set fires on grass as it kills the roots underneath, even if you dig out turf and replace it afterwards. Ask us for a free firepan when organising your equipment hire. What if I need some instruction or a guide? If you’re at all unsure about your ability to undertake the journey you have in mind, without an experienced paddler, please get in touch for advice.